I love Holidays.. it means my man is home with me, no school for the children, and we can all kick back and hang and do our own thing. We have no plans other than watching a movie or two, and me getting my scrap on... plus reading with Samantha. She LOVES that she can read now, and so do I. It's fun helping/watching her sound out new words in a book. 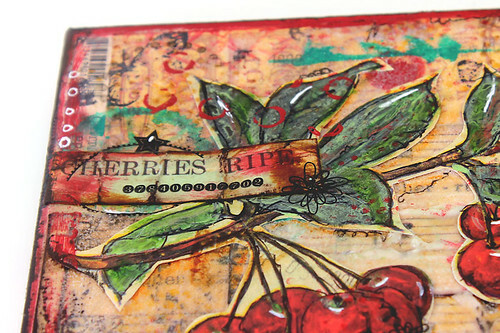 I uploaded the Tallyscrapper September kit video reveal yesterday, you can see it below. 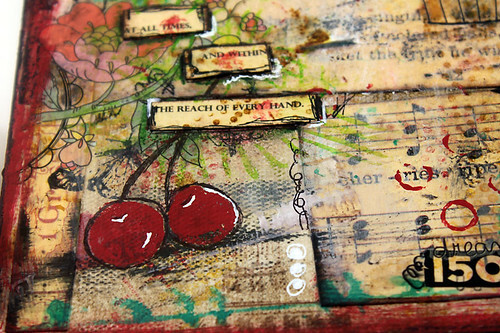 And I can't wait to show you the canvas I created with the kit. 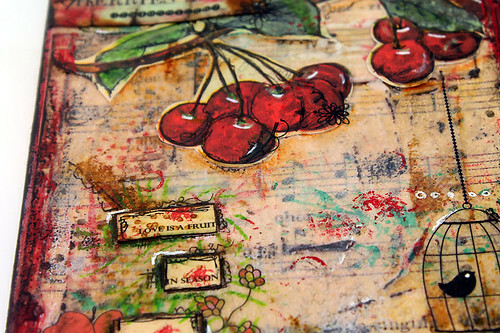 As soon as I saw the Cherries Ripe paper with the music notes and fruit, I knew I wanted to turn it into a canvas for my kitchen. This is photo heavy, and you can view these images larger just by clicking on the image, it will open a new window showing you the photo at my flickr account. 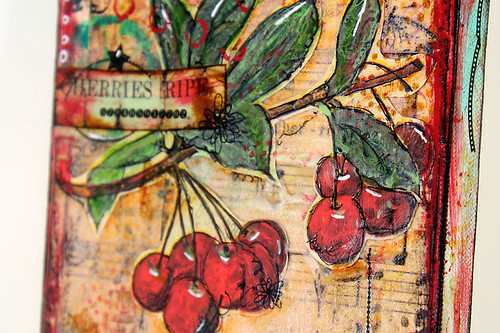 I started this canvas off by loosely cutting out the cherry graphic from the JB paper. Then I cut out various sizes of pattern paper and added some course gel paste to a few of the pattern paper blocks. 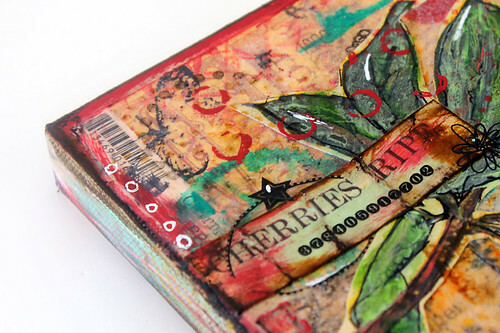 Once dried, it gives the paper a sandy finish, and adds so much texture, it's awesome. I inked the edges of my pp blocks, then mod podged them down to the canvas. 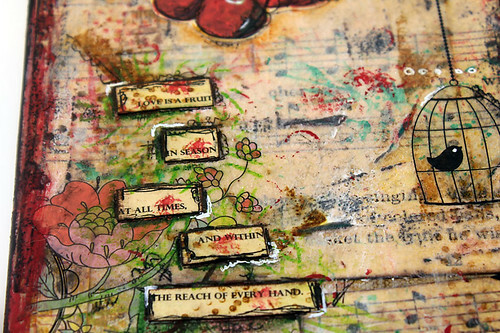 Then it was a matter of adding more color and layers by stamping, doodling, and painting.. adding rub ons and more stamping. Couldn't have done it without the gorgeous September Tally kit. Oh, and the Chili Powder red paint dabber.. the paint comes out wonderfully from the tip.. you can get heavy or light applications depending on if you squeeze the bottle lightly or harder. <3 it. the color is amazing. The two cherries beneath the quote, were made by just making a large paint dot with the JB Dabber.. then I outlined it and gave it pen stems. Quote by Mother Theresa reads, "Love is a Fruit in season at all times, and within the reach of every hand."